In memory of our sweet little Phoenix. I swore to myself I would not come back and do this to myself any longer, but today I've come back to honour dear, sweet Phoenix ... that she lived, that she was loved, that she died. I joined the forum and the Hornby Eagle cam in 2006, and along with the rest of the world, fell in love with Ma and Pa Hornby. Many of us recall the heartache of that first year, and can never forget Ma's cry from the centre of her being. We shared with them the disappointment of the year that followed, last year's celebration with the arrival of Hope and Echo, and the devastation that surrounded Echo's death. I'm heartbroken that beautiful Phoenix is gone. Another loss for Ma and Pa, and all of us who care. Our hopes dashed for the beloved Hornby's, for a healthy, majestic and spirited Phoenix to soar the skies as a fresh new symbol of nature's beauty and strength. Gone our hopes for this magnificent creature; gone another little part of our hearts ... our worlds saddened today today. But with their short lives and untimely deaths, both Echo and Phoenix have reaffirmed to each of us that we have love and caring in our hearts and souls. As long as we are alive, we can be hurt ... but as long as we can hurt, we are alive. And to those who question if there is something wrong with them for caring so deeply ... One day I was crying over a dead chipmunk, when my neighbour and dear friend, a scientific-minded medical doctor, came over to visit. When I apologized for being so upset over a dead chipmunk, my friend said "The world would be a much better place if there were more tender-hearted people like you". Barbarella, your video is so moving! Bubbles, I needed my French dictionary-- well worth pulling it off the shelf for your beautiful poem. And Bigbird, so glad you posted. My heart goes out to you. Bless you and your family. Lovely tributes to Phoenix. The delight of watching Phoenix grow was a 1st time experience for me. I eagerly watched as Phoenix changed over the last couple of months. I remember the tender way he was sheltered when it rained. The way Phoenix hid from the wind. The sound she made when food was brought to the nest by her devoted parents. I also remember the first sneeze and the suttle changes that followed. I was so sure I would see Phoenix fly for the first time. I will truly miss precious Phoenix. 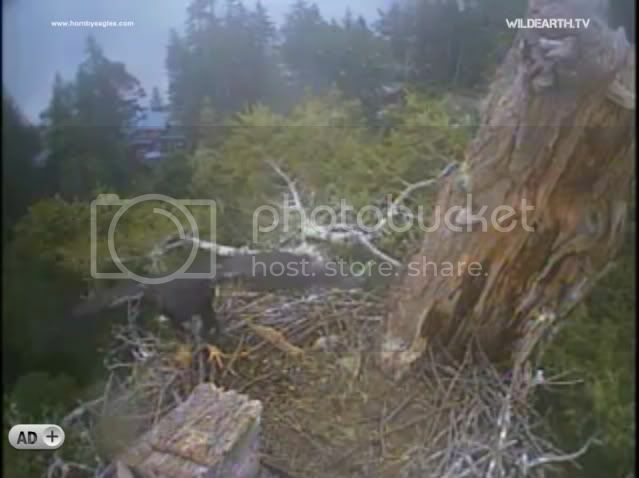 I was watching one of the videos and saw one of the parents preening Phoenix's leg, awww so precious. You have gone to soar with the angels but your spirit remains on Hornby Island and will live on forever in our hearts. You were so stong and brave and I am very grateful that I was able to observe your life on earth. I love and miss you (((Phoe))). 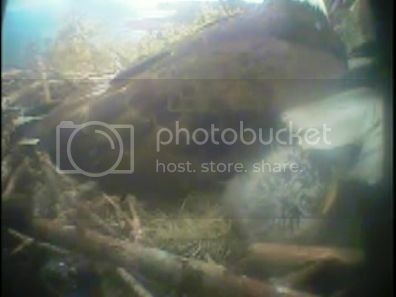 awww beans, it was your video where I saw parent preen Phoenix's leg. I think this video by eagle_lover belongs here too. I loved that moment, emc. I had to choose between two clips to add at that point of of the "Remembering Phoenix" video. Phoenix looks like she is wearing a little hat. What precious memories of Phoenix! I ran across this video on youtube just now. It's about intruders near the nest on Mother's Day, and how mom and dad reacted... sounding the alert, and getting stressed, while our little Phoenix barely stirred from her nap. That was quite a dust-up, and Madame Hornby was panting when she finally returned to her perch on top of the close-up cam. They don't allow other Bald Eagles in their territory. Eaglets are told to go flat and still when there is any threat. I loved listened to Phoe sing like a little teapot! So I made a recording so I can listen to her sing forever. You can use this as a ringtone too if you wanted to. Oh how I miss my sweet Phoe! Yet those who wait for the Lord will gain new strength;They will mount up with wings like eagles,They will run and not get tired,They will walk and not become weary. Thanks for the nostalgic recording of Phoenix!